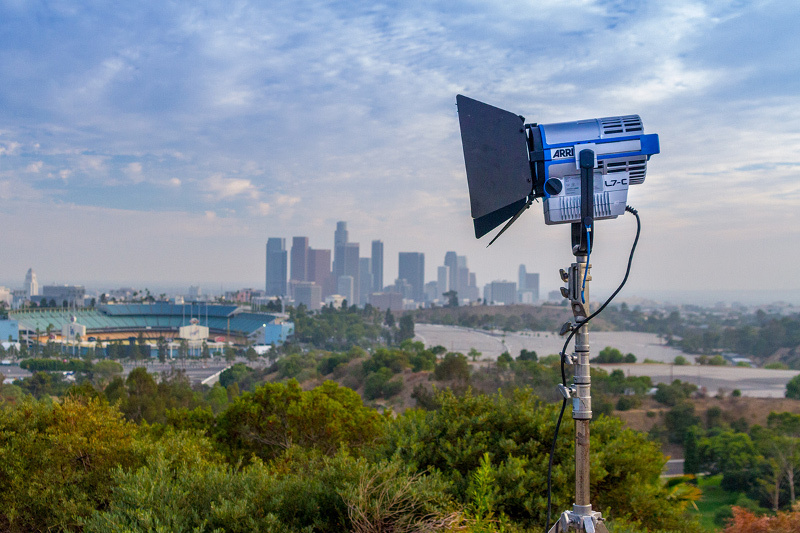 The ARRI L7-C (LE2) Color LED Fresnel is at the forefront of a new generation of lighting equipment that can effortlessly be integrated into the studio or location without sacrificing quality or performance. When it comes to film lighting, a piece of equipment as versatile as the ARRI L7-C can be extremely useful and can save you time and money. This version of the L7-C is actually 25% brighter than the older version but like the older version can change its hue, saturation, adjust color temperature from 2,800 K to 10,000 K, control plus or minus green and RGBW colors. With this versatility you can basically match any light in your project whether it be tungsten, HMI, or fluorescent fixtures. The L7-C (LE2) produces a light output equivalent of a 1000W tungsten light while drawing only 2 amps compared to an 8 amp power draw of a 1000w tungsten. The L7 emits a cool light which means lower heat and AC bills in the studio. You actually can run 10 L7’s safely off of a 20A, 110V outlet as opposed to two 1,000W or three 650W standard tungsten fixtures. Not only would you be impressed with its versatility but also its light quality. Light quality is a big issue in the LED world. As more and more companies decided to join the LED game it is very important to point out that all LED lights are not created equal. With the amount of time, money, and research it takes to create a high quality LED product it is a huge challenge that most manufacturers are not willing to embark on. This is where ARRI’s experience of bringing quality products to the marketplace works to their advantage. The amount of research and development that ARRI puts into everyone of its products is admirable and the L7-C is no exception. Checkout the video below to see top 5 reasons why we think you should use the L7-C in your next project. © 2016 MPS Lighting Repair. All rights reserved.